I’m a member of Alpha Kappa Alpha Sorority, Inc. In Greek life, AKA and my chapter specifically is a world away from the sororities at the center of the University of Alabama controversy. For starters AKA, like other National Pan-Hellenic Council organizations, is an international sorority, compared to the locally or regionally centered U of A organizations. AKA is also an organization that demands a lifetime commitment and has many more graduate chapters (not for graduate school students, but for everyone who is no longer in undergrad) and graduate members than undergraduate members. We conduct membership intake in a totally different way from the simultaneous campus-wide bid system. My initiation chapter wasn’t just at one campus, but was composed of women from three universities. And most noticeably, although there are many members of every race across the globe, Alpha Kappa Alpha is a historically black sorority. But differences aside, my own experience allows me to see why it is important for black students to have access to historically white sororities. I feel pretty much the same way I felt about the importance of passing marriage equality legislation. Are there other areas of the LGBTQ rights movement that are equally or more pressing? Sure. Does every queer person even find the idea of marriage desirable? No, they don’t. Is the institution of marriage fundamentally screwed up and oppressive in many, many ways? Absolutely. Do queer people who reject marriage and the movement to be accepted by the status quo have a point? Yes! Wouldn’t it have been better to radically shift the system to address those issues, keep the government out of personal commitments, and make it so that marriage doesn’t create two classes of citizens with unequal rights- the married and the not married? I think so. But the downfall of DOMA created tangible improvements in the lives of many queer people, and that to me made it a thing worth fighting for. That’s how I see the fight to integrate the University of Alabama’s historically white sororities. Whether anybody likes it or not these sororities provide access to resources for members. Across the country membership in historically white, multicultural, and historically black, Asian American, Native American, and Latin@ greek organizations gives one all types of social and economic capital. Access to parties and other social events, exclusive alumnae networks, campus leadership experience. At big flagship state schools the privileges can be even more extreme. According to my girlfriend, also a NPHC sorority member, her university hosts entire job fairs that are only open to students in the greek system. At the University of Alabama there is “the “Machine,” a secretive coalition of traditionally white fraternities and sororities that controls campus politics,” a phenomenon I know also exists in many other states and that often exerts influence outside the space and time of campus politics, heavily influencing the election of state and regional politicians. It’s all pretty weird and problematic and its easy to see why. At the University of Alabama minority students are “routinely shut out of positions in student government because they can’t get endorsements from The Machine.” Around the country there are a host of other issues. With its legacy admission policy (that by definition systematically underprivileges first generation college students), high membership price tag, and intensive and time consuming membership intake process that is difficult for working students to participate in, my own sorority clearly has some class issues to figure out. And I could write a whole other post about the blatant culture of homophobia that permeates historically black fraternities and has undoubtedly blocked many gay men from entering the strong personal and professional networks that NPHC fraternities represent. And so, while it is clear that the tacit exclusion of black women of the University of Alabama’s historically white sororities represents a form of institutionally sanctioned racism…. Aren’t there other more pressing structural barriers facing University of Alabama students of color? I’m certain the answer is yes. Does every black women person even find the bidding for membership in the historically white sororities desirable? Nope. Is the institution of Greek life fundamentally screwed up and oppressive in many, many ways? Absolutely. 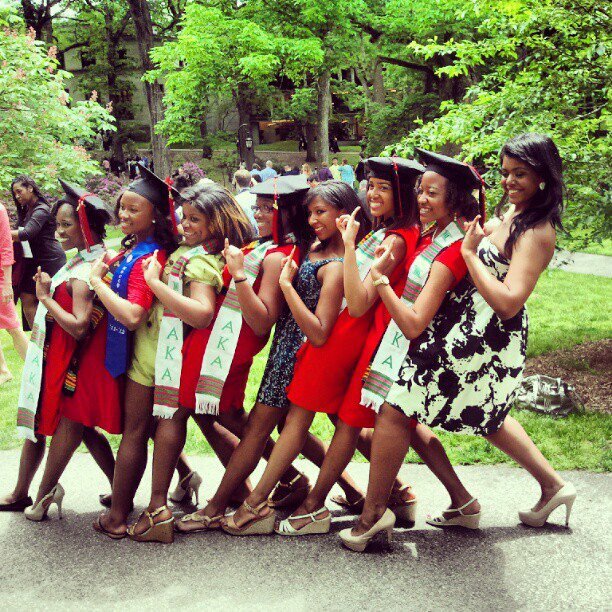 Do women people who reject sororities and the movement to be accepted by the status quo have a point? Yes! Wouldn’t it be better if, I dunno… Greek org members at the University of Alabama didn’t get random social perks like reserved seating at football games, if they didn’t control who is elected to Student Government, if gaining access to these organizations wasn’t the key to getting choice on campus jobs for students of color? Well duh. But opening up this inherently flawed system to students of color will lead to substantial improvements in the college experience, and even expanded life opportunities, for many of them– whether one likes that this is the reality or not. And that to me makes it a thing worth fighting for. I applaud your candor! This is extremely well-written and thoughtful. I absolutely agree with you. That was interesting, and I’m glad you tied it to the larger issue of whether institutions deserve their outsized role in society. You suggest that, like in marriage equality, the problems will be reduced when people are not kept out based upon their skin color or sexual orientation. However, fraternities and sororities are not like marriage. By definition, the Greek system is an exclusive club that provides a lot of benefits to its members. It’s never going to be open to everyone. That’s where it differs from marriage, which is (or hopefully will one day be) in principle open to every willing pair. Marriage is an institution with flaws that may be worth saving. The Greek system’s flaws are baked into the cake. Yes, it will be better if fraternities and sororities were open to all races and sexual orientations. (It’d be nice if more of them were open to both men and women, too.) But it’s never going to be a system that will accommodate everyone who would like to participate. These exclusive clubs will continue to get perks like the special football tickets and members-only job fairs cited in the article. Some of their members will get nice jobs that would otherwise go to someone more qualified. It will be a stepping stone for admission to the country clubs and other exclusive organizations for adults. It’s a way for wealthy and privileged people to consolidate their power. And it makes a difference in people’s lives — for the benefit of some and at the expense of others. You acknowledge these problems but still wants to be a part of the institution. How do you feel about those who still won’t be allowed in after her proposed changes are implemented? Dominique from reading your post and I read it more than once. What I came away with was in hooking up with a segregated sorority it will supposedly open doors in the way of job opportunities and other things you mentioned. Still, I don’t feel that you made a truly bona-fide case for fighting to get admitted to these kinds of organizations. Then there is a downside, some black women who get admitted to white sororities are going take on white values. They will be absolutely useless to the black communities from where they came. They will be “stuck up” or sophisticated. Some of these black females will looking down their noses at those who even nurtured them in their early years.